Our hometown heroes save thousands in closing costs when purchasing a home through the Hometown Heroes program and using our wonderful partners! 20% commission rebate from a HTH certified realtor partner Ryan Harlan. $750 lender credit from Lender,credited at closing. Additionally, We can often negotiate up to 3% (or up to 6% for government loans) in seller concessions to help cover your closing costs. 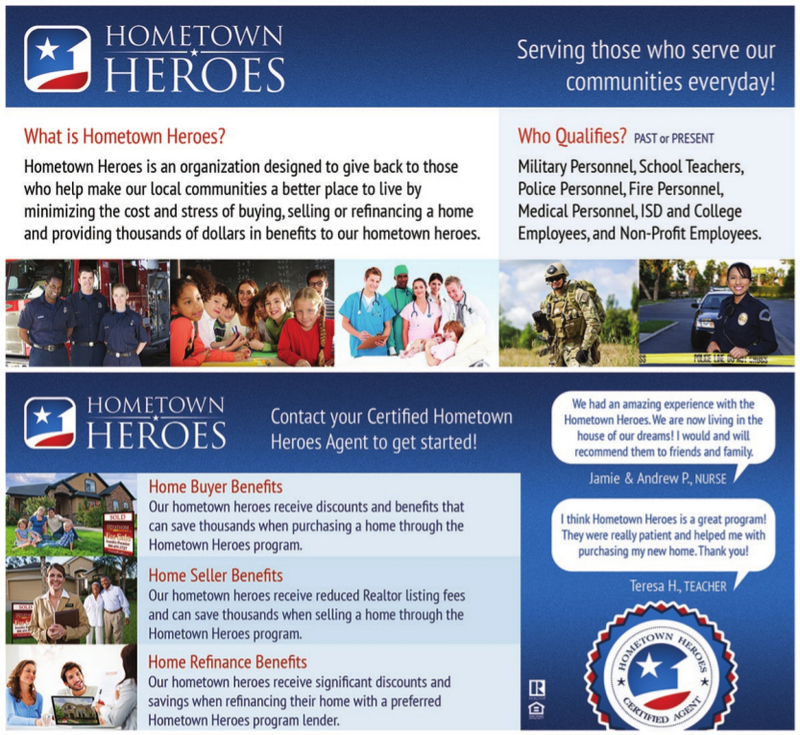 Our hometown heroes save an average of $3,520* when selling/buying a home through the Hometown Heroes program! *Based on a $200,000 home. Are you or do you know a Hometown Hero? We all know many who fall into this category: teachers, school employees, military personnel, police, firefighters, medical personnel, college employees, and non-profit employees, just to name a few. Whether in the past or present, each of these individuals has made an impact on our community. The Hometown Heroes program is an organization designed to give back to those who help make out local communities a better place to live by minimizing the cost and stress of buying, selling or refinancing a home. This program provides thousands of dollars in benefits to our Hometown Heroes. Recently, a high school teacher closed on a home with our program. At 24 years old, she is thrilled to be living in her first home. Ashley H. did not pay an application fee, the industry standard 1% origination fee, or an appraisal fee; she was also reimbursed up to $350 for her home inspection. Even the closing attorney participated by lowering their rate for our Hero! If you know someone who qualifies for this program, please have them contact me at 704-608-4767. It will be my pleasure to help make another dream come true!